"The devotion to the Eucharist," St. Pius X, the Pope of the Eucharist, said, "is the most noble, because it has God as its object; it is the most profitable for salvation, because It gives us the Author of Grace; it is the sweetest, because the Lord is Sweetness Itself." The devotion to the Eucharist, together with the devotion to the Blessed Mother, is a devotion of Paradise, because it is the devotion which the Angels and Saints of Heaven also have. "There is a school in Heaven," the mystic, St. Gemma Galgani, used to say, "and there one has only to learn how to love. The school is in the Cenacle; the Teacher is Jesus; the matter taught is His flesh and His Blood." All expressions of love, even the highest and the most profound, are verified in the Eucharist. Thus, it is a Love that is crucified, a Love that unites, a Love that adores, a Love that contemplates, a Love that prays, a Love that delightfully satisfies. "To be possessed by Jesus and to possess Him --- that is the perfect reign of Love," wrote St. Peter Julian Eymard. The Eucharist achieves this "perfect reign of Love" in all, who are pure of heart, approach the Holy Tabernacle and unite themselves to Jesus in the Host with humility and love. In the Eucharist, Jesus sacrifices Himself for us, He gives Himself to us, He remains among us with infinite humility and love. "For One in such a lofty position to stoop so low is a marvel that is staggering," exclaimed the Seraphic Father, St. Francis. "What sublime humility and humble sublimeness, that the Lord of the Universe, the Divine Son of God, should so stoop as to hide Himself under the appearance of bread for our salvation! Behold the humble way of God, my brothers. Therefore, do not hold yourselves to be anything of yourselves, so that you may be entirely acceptable to One Who gives Himself entirely to you". And St. Alphonsus Liguori adds with his usual affectionate tenderness, "My Jesus! 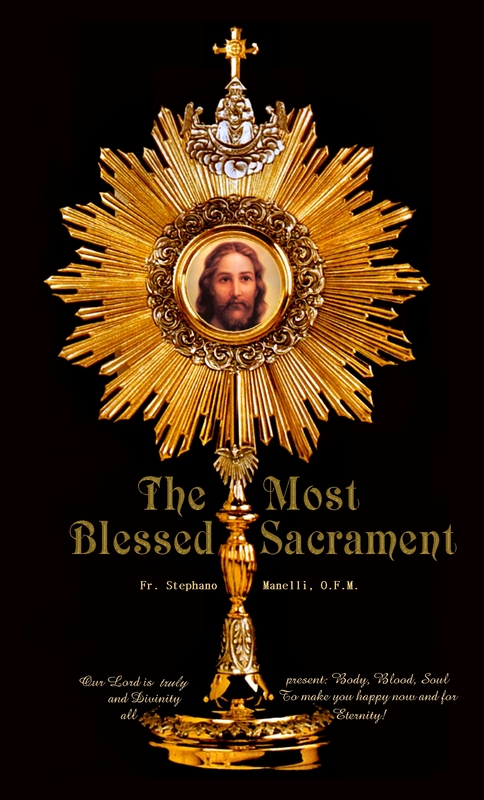 What a lovable contrivance this holy Sacrament was --- that You would hide under the appearance of bread to make Yourself loved and to be available for a visit by anyone who desires You!" May some remembrance of the priest, who every day gives us Jesus, and of the Blessed Virgin Mary, Mother of Jesus our God and all priests, be always in our affections toward the Most Holy Sacrament; for the Eucharist, Our Lady, and the priest are inseparable, just as Jesus, Mary and St. John the Evangelist were inseparable on Calvary. Let us learn all this in the school of the Saints. They lived in a way that was ardent and sublime, as true seraphims of Love for the Eucharist. These are the ones, as Vatican II declares (Lumen Gentium, n. 50), who are the "most safe path" to the Eucharistic God of Love.